I never met my paternal Grandfather, and my maternal Grandfather refused to see any of his grandchildren. No one is sure just why. 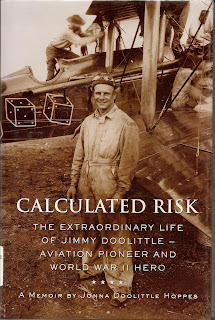 No matter, this book was written by Jimmy Doolittle's grandaughter, Jonna Doolittle Hoppes. It teems with the affection she held for this man. She has mined a treasure of articles and books, and even her Grandfather's writings on technical issues, to produce a book that is not only the story of one the world's greatest aviators, but also the story of a marriage. Josephine Doolittle, known to all simply as "Joe", for her favorite Uncle, was a woman with a wry sense of humor and a quick wit. She had to be, to keep up with her husband Jimmy. They first met in High School, and after that they were constantly together. They approached her Dad on Christmas eve 1921, to seek his blessing to be married, and when he refused, they left anyway to begin their lives together. They never dreamt that Jimmy's love of flying would touch the entire world, and that Joe's love and support of him would have such an effect upon history. Jimmy grew up in Nome, Alaska, where his dad was a carpenter during the Gold Rush. Young Jimmy would live in a few different places while growing up, such as Seattle, San Francisco and even Los Angeles. This would be only the beginning of a life that would take him around the world more than once, setting new records all along the way. He is the highest ranking Officer that I know of, who has flown in combat, leading the famed "Doolittle Raids" against Japan from the carrier USS Hornet in early 1942, at a time when we were losing battle after battle in the Pacific. His reputation as the "Master of the Calculated Risk" made him the ideal candidate to both plan, and lead, this mission. His lists of "firsts" in the field of Aviation include flying cross country in less than 24 hours, ansd being the first to fly "blind", using only primitive instruments like Radio Direction Finders and Dead Reckoning to ascertain his position. He was the winner of many of the major air races during the 1930's and went on to command the Allied 12th, 8th and 15th Air Forces during World War two in three seperate theatres of operations. The author documents both General Doolittles achievements as well as his faults in an open and honest book. Clearly she loved both of her grandparents and that affection shines through each chapter. She uses all of her Dad's anecdotes and stories, while backing them up with her Grandmother Joe's recollections of the same incidents. This is a wonderfully crafted biography of two ordinary people who went on to change the course of history, both in war and peace. That it is written with so much love by their grandaughter makes it all the more endearing to the reader.